A pianist/composer’s dream of dog-sledding in Alaska came true. It ended with a severed finger. Composer Yotam Haber speaks with WUWM Lake Effect’s Maayan Silver about the world premiere of his modern concerto “The Little Bird” at his alma mater, Nicolet High School. Current Nicolet High School students are getting a musical education from those who came before them. This week, 2004 alumna violinist Hanna Hurwitz came back to the school to be part of the music department’s Artist in Residence Program. She’s mentoring the school orchestra in preparation for Thursday night’s world premiere of a new modern concerto called The Little Bird. 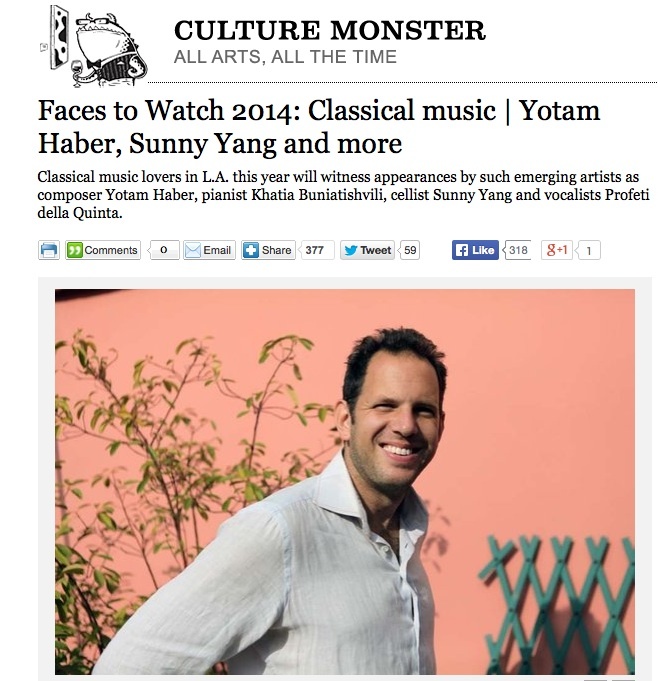 It’s composed by alumnus Yotam Haber who’s assistant professor of composition at the University of New Orleans. He graduated from Nicolet in 1994. He was exposed to contemporary music through an art teacher at Nicolet and realized that living composers did exist and that composition was something he wanted to do. “I think [music study and appreciation] enriches us, makes us better people no matter what field we go into,” he says. “Do you mind if I hit this?” Yotam Haber picks up a scythe-shaped strip of rusted metal, approaches a buoy and taps its side, which burps out a dull thud. He shakes his head. “Not really what I was looking for.” He taps another buoy, and it sings a deep but short gong. He smiles. Giant-sized, globe-shaped buoys — speckled with barnacles and rust and tied with tires and chains — populate a sprawling shipyard at DCL Mooring and Rigging on the edge of the Industrial Canal like Pee-wee’s Playhouse-sized fishing bobbles. They’re set decoration for Haber’s New Water Music, a piece the composer designed for a massive assembly of musicians on Lake Pontchartrain. The performance, organized by New Orleans Airlift, includes the Louisiana Philharmonic Orchestra, shrimp boats and a cast of artists and makers spanning fishing communities and amateur musicians. It runs April 8 at Seabrook Boat Launch. If the concert is rained out, there will be a performance April 9. The Kronos Quartet is at it again, committing acts of imaginative generosity in support of creativity. Having commissioned more than 800 new works of music over 40-plus years in action, it now has embarked on a program called Fifty for the Future, a commitment to commission 50 pieces over the next five years, geared to the training of students and young professionals. Two of these pieces were on display in a Washington Performing Arts-sponsored program at Sixth and I on Saturday — “Hilathi,” by the young Polish composer Aleksander Kosciow, and the world premiere of “From the Book,” by the Dutch-Israeli composer Yotam Haber. Both performances were careful and committed, the quiet, hymn-like simplicity of “Hilathi” handled with warm, balanced restraint and the more extroverted intensity of Haber’s settings of melodies from Jewish liturgy given a lively sense of shape and rhythm and freedom. As music enthusiasts, every once in awhile we need an album that challenges our perception of contemporary music. Amidst the popular theme of ethereal zen-like music comes this album from the lauded Yotam Haber. This composer is making real waves in the contemporary classical music world, named by the LA Times as one of 2014’s ”Faces to Watch,” and has received accolades, grants, and press from across the globe. Torus, named for the geometrical shape which matches a donut or a tire, is an experience in cyclisicm and demands to be listened to from beginning to end with no distraction. While a great deal of music in media has faded to be nothing more than ornamental embellishments for visual material, this album requires your full attention, and it wont be denied. It’s an album that must be approached with resolve and a willingness to go on an emotional and heartwrenching journey that won’t be paralleled. From the opening of We Were All, the music recalls elements of Ligeti and John Adams with its encompassing orchestrations that adventurously match a counter-tenor voice with muted trumpets and pitched percussion. Haber is known for choosing text based on the sound rather than the content, and this is no exception. The text, written by gifted poet Andrea Cohen, illustrates a feeling of discovering acceptance in not getting what you want. There’s an interesting parallel with this text, joining disappointment about lost cherries and the disappointment over other losses in life: careers, family, or opportunities. On Leaving Brooklyn perfectly encompasses the bittersweet reality of leaving a place behind. The text, written by Julia Kasdorf, pulls on the heartstrings and reminds the listener what Home felt like. The sliding, hollow melodies and polyphonic rhythms give rise to a feeling of unfamiliarity and strangeness, exactly how one feels when trying to settle somewhere new. The soloist, Mireille Asselin, floats above it all with a yearning desperation to forget what she once knew to find happiness in a new land. The next piece on the album, Last Skin, is divided between 2 tracks. Using scordatura (detuned strings), Haber creates a musical landscape of 16 open pitches, which lends an expressive and haunting timbre to the music. This piece invokes an element of cyclicism as it rediscovers musical content from We Were All. This piece was composed as a commission for a friend’s parent who had passed, and it examines the different ways that people grieve. The first half delves into the chaotic anger that we feel when we’ve lost someone we love, and takes the listener on a journey of loud, unsustainable anguish, the kind that is all-encompassing and destructive. This piece demands attention and thought, ripping away any illusions of hope and reconciliation. Along the seven stages of grief, this half of Last Skin travels through denial, guilt, and anger or bargaining. The second half of the piece focuses on painful reflection and the numb acceptance that accompanies it. Haber lets the open strings play to their strengths, creating chilling and painstakingly hollow melodies that echo the feeling of loss. Together, both halves of Last Skin travel through the emotions of loss and grief, examining both ends of the emotional spectrum: anger, and numb reflection. The title work, Torus, is expertly performed by the Mivos Quartet. Composed to reflect the huge, intimidating sculptures of Richard Serra, the performers use filters to affect their sound in real time. This piece is threatening and frightening, scaling from a breakneck pace in the beginning to a rumbling creep at the final note. Torus was not written to be sidelined by visual media, it was written to be an all-encompassing aural experience that’s like an assault on the senses. From the Book of Maintenance and Sustenance is the next in Haber’s series of pieces that are born from Italian Jewish archival recordings. This piece invokes an Italian Jewish liturgical melody, a plaintive and calming eight minutes that rounds out the emotional roller coaster of Torus. In the end, it’s the peace that we crave after the loss, the panic, and the chaos of life; it’s a fitting end to this exhausting album. This is the music that people think of when they hear “contemporary classical music.” It’s a demanding, full-throttle musical experience that’s not for the faint of heart. It demands attention and an openness to emotion, and it doesn’t take no for an answer. Yotam Haber composed a collection of chamber pieces that fit together like the pieces of a puzzle– each piece is interesting on its own, but together they make a mural of the mind. El final va estar una cirereta que ornamenta un fantàstic pastís sonor, Torus de Yotam Haber és una enèrgica, trepidant i sensacional peça extremadament exigent amb els mecanismes de les dinàmiques sobtades, amb uns canvis bruscos de sonoritats que el quartet dominava sobradament, amb uns detalls en pianíssim que eren impossibles d’oir per l’acústica de la plaça i per la tos pneumònica, una obra que combina textures a través de les tècniques esteses i sons convencionals…. The first track of Yotam Haber’s debut album, “Torus” opens with pointillistic vocal deconstructions of the phrase “We were all hungry.” A work for voice and chamber ensemble set to a poem of the same title by Andrea Cohen, We Were All describes blackbirds raiding a cherry tree, depleting the fruit before the poem’s protagonist is able to get any for her own bowl. While the poem is a response to Cohen’s mother’s death, Haber’s music is as much a fragmented, fluttering take on the literal narrative. Mallets and pizzicato strings recall the beating of wings. Soprano and countertenor move between long phrases and antiphonal, bird-like calls. Performed with poignant energy by New York’s chamber orchestra Contemporaneous, it’s playful and uneven – more a celebration of life than a mourning of death. Indeed, the bulk of this chamber-music collection concentrates on periods of flux: the transition of life to death, the migration of peoples, art in motion. On Leaving Brooklyn re-arranges American poet Julia Kasdorf’s “After Psalm 137.” A haunting weave of of vocals and single violin, the work mirrors not only the Hebrew bible (here describing the sadness of Jewish people in exile following the Babylonian conquest of Jerusalem) but Haber’s own migration: he was born in the Netherlands, grew up in Israel, Nigeria and Milwaukee, lived in New York City, where he served as artistic director of the annual MATA Festival, and is currently on faculty at the University of New Orleans. The collection’s most visceral moments, are when the [instrumental] music speaks for itself. Last Skin moves between moments of tremoloed stasis and violent swoops. Split into two “emotional states” and performed on 8 individually-tuned microtonal violins, Haber sites the music’s inspiration as the Baroque doctrine of the affections, a 17th and 18th century theory proposing that certain musical devices can evoke very specific, involuntary emotional responses in the listener. The title track Torus feeds the elastic Mivos Quartet through filters to conjure the frightening beauty of artist Richard Serra’s massive metal sculptures. The distorted strings spin around one another at extremes of volume and speed. “Torus” closes with the quietly spiritual and luminous From the Book of Maintenance and Sustenance for violist Max Mandel and pianist Eric Huebner. Using archival recordings of music from the Italian Jewish community, the music moves from screaming harmonics to quiet passages reminiscent of plainchant. It’s a snapshot of a soul in flux – moving from life to the afterlife, from Israel to New Orleans – a composer looking for a sound and finding something powerful along the way. Furthermore, this wasn’t just any orchestra. It was Contemporaneous, the premier orchestra dedicated to promoting and performing new music. As I arrived they were finishing rehearsing a piece by Thomas Adès and Haber’s piece was ready to be recorded. Haber, in addition to numerous awards and commissions, was for some years the Artistic Director of MATA, the organization founded by Philip Glass and others to commission and present new works. His music, based loosely on a minimalist style, is hauntingly beautiful and seductively hypnotic. The piece I heard, “We Were All,” had all the Haber trademarks I love: the melodic loops of phrases, the sensual tonalities and the completely original harmonic language. Based on “Cherries,” a poem by Andrea Cohen, the piece started with three singers singing separate, staccato syllables in a quasi-baroque style; these syllabic organisms then cautiously migrated into the orchestra, instrument by instrument, until a great crescendo heralded the climax, the entire orchestra elaborating on the tiny phrases, timpani’s banging, trumpets blaring, followed by a gradual decrescendo as the syllabic phrases dissipated to their original state. It was a gorgeous, explosive piece: the creation of the universe, if you will, in less than fifteen minutes. Yotam Haber’s alluring “From the Book of Maintenance and Sustenance” also proved engaging. Mr. Haber used the soulful lower register of the viola to expressive effect, and its higher register to create intriguing timbres. Fluttering trills unfolded over lone piano notes; bell-like descending piano chords were echoed by gently ascending viola motifs. The piece faded to an enigmatic whisper at the end. “One of the highlights from that afternoon was a piece by Yotam Haber titled I Am, written for mixed choir and string quartet. The text, taken from the writings of Agni Yoga, a branch of Buddhist Yoga founded in New York in 1920, is based on short phrases that could be thought of as seven individual mantras. The rhythmic and pulsating piece repeated the title of work and looked to someone or something else for inspiration. “Your bliss I am” and “Your joy I am” are declaimed by the chorus along with other words that expressed a search for personal enlightenment. Haber’s sound has been greatly influenced by the masters of minimalism and post-minimalism, Steve Reich and John Adams, with their accessible poly-rhythms (including a direct nod to Reich’s Clapping Music) and tonal harmonies. The piece was successful in taking these ideas and adding a much greater dramatic arch. The work provided balance and tension that allowed the audience to delve deeper into the individual “mantras” and reflect on what inspires and gives us strength.